Um, Monday? Five days hence Monday, you mean? I looked up at the broken cupboards full of stuff that would need to be packed away, the clutter in the living room that would need to be removed to make way for a temporary kitchen, the dining room teeming with art projects and various paperwork that would need to be filed or recycled, and tried to wrap my head around the idea of having no kitchen to make meals or clean dishes for three to four weeks starting in five days. We’d have one weekend to finalize the last of the design plan (we need to pick flooring, a faucet, paint colour, counters and handles for the drawers and cupboards), pack the kitchen cupboards and drawers, empty most of the dining room, clear space in the garage for the delivery of the new cupboards, make a temporary kitchen, and plan a minimum of a week’s worth of no-stove meals. “Sure,” I replied, because I have no sense of self preservation whatsoever. Carpe that diem, right? We met with the contractor on Saturday to do a crash session on the remaining details: floors, counters, paint, faucet, and drawer and cupboard pulls. In other words, all the things that I thought were inconsequential. “I am more concerned with the fact of having a floor than what it looks like,” I told the contractor the last day we met to sign the contract. The contractor, who has gotten to know us fairly well by now, pointed at Beloved and said, “So, you’re coming with me to the tile store?” Meh, floors. Whatever. To my surprise, though, picking out these finishing touches made me almost as excited as the idea of my coveted pot drawers. 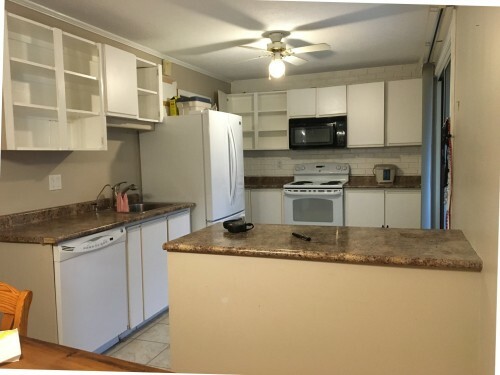 Since we are building on exactly the same footprint, with no new appliances, and on a very tight budget, I was really beginning to feel like the new kitchen might not be tens of thousands of dollars better than the old kitchen. Then I found out you can get ceramic tile floor that looks like knotty pine, and vintagey-cool drawer pulls that look like they might have come out of an old library. I am really happy now that I don’t have to wait for months to see it all come together, because for the first time I’m feeling really excited about the renovation, instead of just enduring it and grumbling about the cost. Having said that, I am not looking forward to the next few weeks without a kitchen. We have our BBQ, which has a side burner for pots that I’ve never actually used but I checked and still works. We’ll have the microwave, although it will be displaced from its usual perch above the oven. And we’ll just roll the fridge into the dining room for the duration, so it will be accessible and functioning. I’ve picked up some big plastic bins to store food like cereal and snacks that might smell appealing to the dog, and I invested in a whackload of compostable paper plates. I think it is the dishwasher that we will miss most of all, and I am trying to decide whether washing dishes will work better in the (tiny) bathroom sink or the (awkwardly positioned and not incredibly clean) basement laundry sink or the bathtub is the least painful option. Saturday and Sunday were a marathon of sorting and packing and discarding and wondering why the heck we have so many packages of yeast in the cupboard, and cursing the multitude of snack bags with less than six pretzels in each. I mostly stayed true to my inner environmentalist, filling the compost and cardboard recycling bins to capacity, but by late in the day Sunday I had abandoned any pretense of careful sorting and packing and was simply cramming stuff into any nearby container with capacity. And I swore to myself that we will never, ever move, because just packing the kitchen was enough to last me another decade. After a full day of packing, trying to cook dinner on Sunday night in an empty kitchen was a bit of a disaster. You don’t realize how much muscle memory is involved in a familiar meal until you try to cook it when none of the tools or ingredients are where they are supposed to be! I can’t tell you how many times I opened a drawer or cupboard to find it empty – not unlike when the power goes out and you walk from room to room automatically hitting light switches and thinking “okay, I’ll watch TV – no wait, I’ll vacuum, no wait, I’ll….” Not to even mention the fun of meal planning for dinners that do not require a stove or much clean-up to execute. I’m seeing a lot of takeout and a lot of living room picnics in our future! So tell me, bloggy peeps, what’s your favourite no-cook meal? I would buy the roast chicken from the grocery store .. good price. easy meal. leftovers for lunches. I was just about to say, “I got nuthin’, I’m just here to learn,” but then it occurred to me: do you have a crock pot? Might be useful. Also, I can’t believe I didn’t think of the BBQ. I’m seriously going to be taking notes through this whole process, because we’ve intended to re-do the kitchen ever since moving here – Meena was 10 months old and she turns 8 in the fall. Because it sounds like we also have the same attitude towards kitchen renos (feeling stalked yet? ): “just make it a kitchen already” and “same appliances same footprint, how much could it really cost?” are extremely familiar sentiments. I want everything to be “just so”, and yet would just as soon outsource the whole shebang, whilst not feeling like I’m getting fleeced. Sounds doable, right? We love grocery store roast chicen too. We also like Chinese takeout. Also, BBQ items would be really handy during a reno. AND….PIZZA!!!!! Salad rolls. Buy rice paper wraps that you soak in water to soften. Fill them with things like store bought precooked chicken breast strips, lettuce (or spinach) shredded carrots, bean sprouts if you like, green onions, fresh herbs like mint or cilantro. Dip in peanut sauce or any other Asian sauce of your choosing. Thirding the chicken, which we chop and use in wraps a la fajita. Lots of possible sandwich variants eg meat and cheese rolled in a wrap. I’m fond of O nigari or sushi if you have a rice maker. Search no cook recipes though, bet you’ll get many ideas!